1 inch quality nylon halter in southwest pattern webbing. for horses 800 to 1100 pounds. 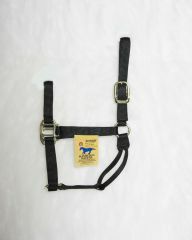 1" Quality Halter, Black, Average Size 800-1100 lbs. 1" Quality Halter, Black, Large Size 1100-1600 lbs. 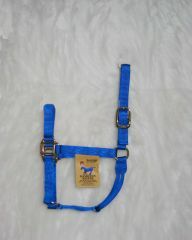 1" Quality Halter, Blue, Average Size 800-1100 lbs. 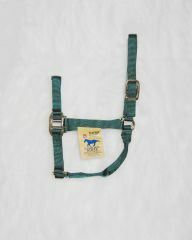 1" Quality Halter, Blue Large Size 1100-1600 lbs. 1" Quality Halter, Blue, Yearling Size 300-500 lbs. 1" Quality Halter, Hunter Green, Average Size 800-1100 lbs. Powerflex is a cohesive flexible bandage manufactured for equine use.powerflex tears clean by hand will not constrict does not stick to skin or hair and stays in place under the most adverse conditions.providing 23lbs.of tensile strength. Wrap leg to provide support or to hold a dressing in place. avoid wrapping to tight and change wrap frequently for best results. 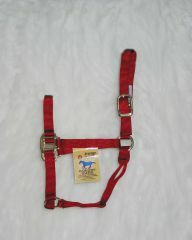 1" Quality Halter, Red, Average Size 800-1100 lbs.